Search Respirators by Manufacturer | Texas America Safety Co.
Texas America Safety Company carries respirators from 3M, Moldex, and MCR. We offer both standard nuissance masks, dust masks, and other type of N95 Respirators. We also offer the half face type of respirator kits and finally respirator fit testing equipment to ensure the masks are working properly. If you know the brand you are looking for, feel free to search respirators by manufacturer on this page. To give you plenty of respirators to choose from, we stock products from top manufacturers. We also carry different styles of respirators. 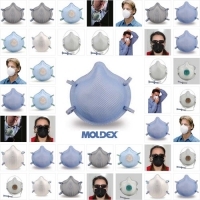 A top manufacturer of disposable respirators is Moldex. This company has been making these products for many years, so you can trust the quality of Moldex products. Over time, Moldex has introduced a number of innovations to their products, which has helped to make their products better. Moldex respirators are designed to eliminate the discomfort that many respirators cause around the bridge of the nose. They also require fewer adjustments than other products. Respirators should be chosen based on site-specific conditions, workplace concentrations and contaminants. Gateway respirators are tested regularly and certified by NIOSH. They provide great filtration against a wide range of particulates. 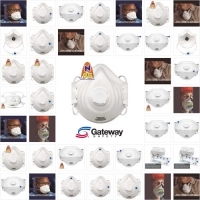 We stock several Gateway respirators, and our N95 style is very popular. These respirators are named N95 because they block 95 percent of harmful airborne particles when tested in worst-case scenarios. If you’re looking for a top manufacturer, you won’t be disappointed with 3M. This company is well-known in a variety of industries, and they manufacture some of the best disposable respirators on the market. 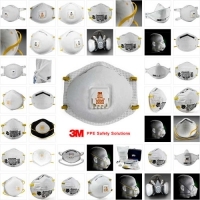 We carry a number of different styles from 3M, so you can find the respirator that is best for your needs. If you don’t like 3M, we stock respirators from several top product lines. You can use this page to sort our selection based on Moldex, Gateway and 3M products.